An LED streetlight shines over a southeast Houston, Texas, neighborhood. Photo by Flickr user meltedplastic, licensed under CC BY-NC-ND 2.0. Brian Wheeler of the BBC shares the story of Karen Snyder, and her friend, Delores Bushong whose neighborhood in Washington DC recently installed 4,000 Kelvin LED streetlights. Snyder and Bushong oppose the bright lights and want their city to adopt lower Kelvin LEDs. 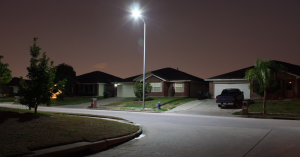 IDA recommends 3,000 Kelvin or less LED lights for street and area lighting applications. You can help spread the word! IDA supports Chapter leaders around the world in their efforts to influence decision-makers about responsible street lighting. Learn more about IDA Chapters here.